Are you tired of throwing away empty filament spools? 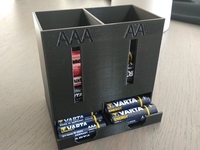 This project allows you to re-purpose them instead of recycling. 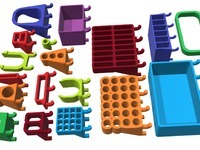 It is designed for the Inland filament spools from Micro Center. A goal of my project was to not only create boxes that fit in the spools, but to make a storage system that is stackable and portable. I also wanted to make drilling the holes for the hinges easy and repeatable. 1) 'Reel Box' - you will need four of these per spool. 2) 'Joiners' - two parts, one for the top of the hole in one reel and the bottom of the hole in the other. 3) 'Handle' - two parts, an adapter and the handle. 4) 'Drilling Guide' - assures holes are located where they belong. 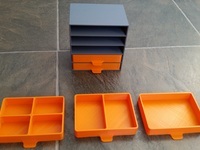 There is at least one other project of this type on Thingiverse ("Spool drawer organizer" by Tanatof). I only discovered it a few days ago. Hence, my project is not a copy of that one, but I am happy to see that we have some similar features. Props to Tanatof for a great, attractive design. Two shells are enough, but you can use three if you want added strength. 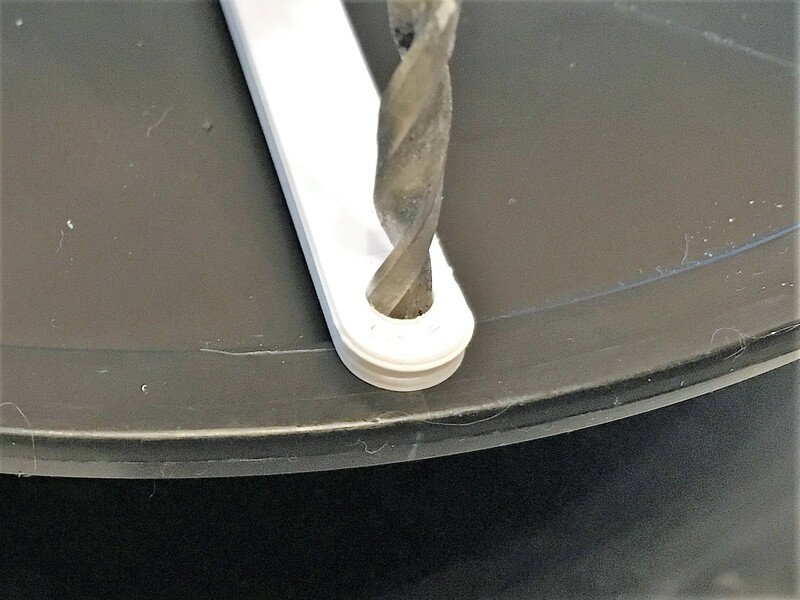 The first step is to make a mark on the both edges of the spool to indicate where the first hole on each side will be drilled. Use a square or a suitable square object to make sure both marks are aligned with each other. Place the Drilling Guide over the reel with the raised 'shoulder' inserted in the center hole. Align the guide to the mark (as pictured), then slowly start drilling. I emphasize slowly because you don't want the drill bit to 'walk'. After the first hole is drilled, simply rotate the Drilling Guide 90 degrees so the pin of the Drilling Guide is over the newly created hole. Repeat for all four holes. Then flip the reel over and repeat, but remember to carefully align the first hole with the mark you made. Each hinge will require a #8 x 2.5" threaded rod, available at most hardware stores. 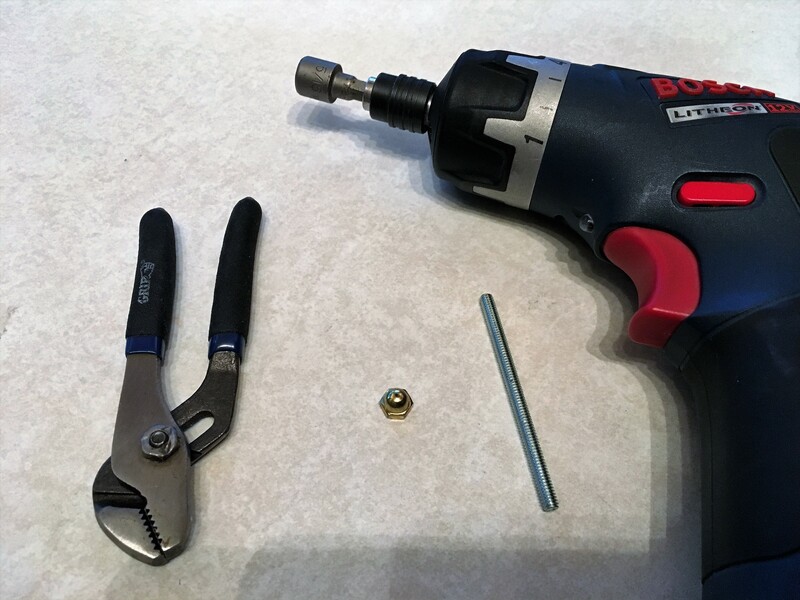 Use a 5/32" acorn nut to simplify driving the threaded rod through the hole in the box. Take care to keep the rod square with the box as you begin driving it into the hole. Since it is a snug fit, drive it in slowly so you don't create too much heat. When the acorn nut bottoms out to the box, remove it and use a pliers to turn the screw in the remaining couple turns by hand until there is an even amount protruding for both ends. Fit the protruding threaded rod ends into the new holes in the spool. Repeat for all four boxes. Voila! You have just re-purposed your spool to store small items. The parts for the Joiners and Handles are quite simple to figure out. You will discover that the Joiners fit very tightly on the inner lip of the spool hole and must be pressed in with some force. That is by design to keep them from falling out, simplifying the task of stacking the spindles together. Use the male threaded Joiner on the top of the lower spindle so the threads go up. The Handle parts thread onto those exposed threads.